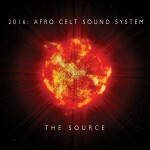 Share the post "Album review: AFRO CELT SOUND SYSTEM – The Source"
Before starting this review a disclaimer of sorts in that this is one version of the Afro Celt Sound System (ACSS). The band reunited last year, however Simon Emmerson announced he was leaving and formed this version of the ACSS, along with N’Faly Kouyate and Johnny Kalsi (the Dohl Foundation). The other version is fronted by James McNally and Martin Russell, who also plan to release a new album this year under the Afro Celt Sound System name. All of course is subject to the outcome of current legal proceedings. So onto the music and there are the usual sprinkling of guests, on this the first album of new ACSS music in ten years. One main collaborator who has a big influence in the album’s sound is acclaimed uillean pipes player Davy Spillane. His playing adds greatly to the Celtic air in the music, including ‘The Magnificent Seven’, which sees the band collaborate again with the Dohl Foundation. N’Faly Kouyate vocals are truly outstanding, listening to them on ‘Cascade’ and ‘A Higher Love’ sweeps the listener away. Griogair adds in pipes and his rap/vocals – not always sure they work for me but then the ACSS has always been about taking in many worldwide musical influences and then melding them into their unique sound. There is lots to explore and enjoy on each listen, be it the trad folk meets Clannad of ‘Where The Rivers Meet’ or the upbeat jazzy dance beat of ‘The Communicator’. This entry was posted in ALBUM REVIEWS, ALBUM REVIEWS (Mobile), All Posts and tagged Afro celt Sound System, album, dance, folk, Griogair, Johnny Kalsi, N’Faly Kouyate, review, Simon Emmerson, the Dohl Foundation, the Source, world music. Bookmark the permalink.